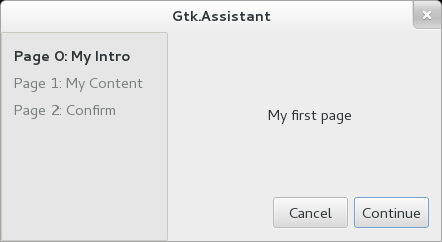 The design of GtkAssistant is that it controls what buttons to show and to make sensitive, based on what it knows about the page sequence and the type of each page, in addition to state information like the page completion and committed status. If you have a case that doesn’t quite fit in Assistants way of handling buttons, you can use the CUSTOM page type and handle buttons yourself. The GtkAssistant implementation of the Buildable interface exposes the action_area as internal children with the name “action_area”. Appends a page to the this. Returns the child widget contained in page number page_num. Inserts a page in the this at a given position. Prepends a page to the this. Removes a widget from the action area of a Assistant . Removes the page_num’s page from this. Switches the page to page_num. Sets the page forwarding function to be page_func. Forces this to recompute the buttons state. The apply signal is emitted when the apply button is clicked. The cancel signal is emitted when then the cancel button is clicked. The close signal is emitted either when the close button of a summary page is clicked, or when the apply button in the last page in the flow (of type gtk_assistant_page_confirm) is clicked. 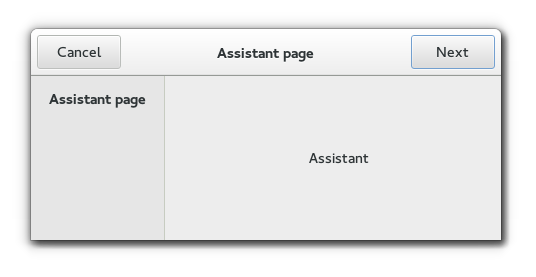 The prepare signal is emitted when a new page is set as the assistant's current page, before making the new page visible.